As long as he can remember, Doyl “Ted” Dickel has always wanted to be an academic. “The culture, the focus on learning, and the excitement of discovery is a surprising amount of fun,” Dickel said. As an assistant research professor in the Solid Mechanics Working Group at CAVS, he focuses primarily on molecular dynamics and fragmentation. Dickel earned his bachelor’s degree in physics from the California Institute of Technology, followed by his doctorate in physics, specifically molecular dynamics, from Clemson University. After receiving his doctorate in 2011, Dickel moved abroad to research dislocation dynamics at the Karlsruhe Institute of Technology in Karlsruhe, Germany. 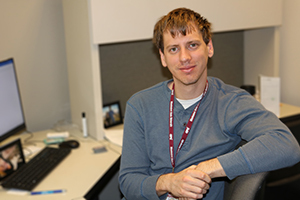 Now at CAVS, Dickel focuses on molecular dynamics, researching machine learning and artificial neural networks. Molecular dynamics is a computer simulation method for studying the physical movements of atoms and molecules. The atoms and molecules are allowed to interact for a fixed time period, giving a view of the dynamic evolution of the system. Dickel studies the multiscale defect formation process and phase – switching behavior in shape memory functional oxides. He also studies fragmentation, which is the simulation and predicting details of fragments before they are broken. After living in Starkville, Mississippi, for four and a half years, he frequents Mississippi State women’s basketball games and values the college town’s atmosphere. MSU’s Center for Advanced Vehicular Systems (CAVS) is online at www.cavs.msstate.edu and can be found on Facebook as @cavsmsstate; Twitter and Instagram as @cavs_msstate.